Visitors tour Holtec’s cavernous factory after a ribbon-cutting ceremony that launched the company’s Krishna P. Singh Technology Campus in South Camden. Blocks from run-down industrial buildings, officials celebrated a gleaming piece of a new Camden on Thursday — launching energy company Holtec International's seven-story glass corporate office and vast manufacturing plant on the waterfront. Joined Thursday by local and state officials as well as representatives of countries where Holtec has business ties, the company showed off its $320 million technology campus, which has views of the Benjamin Franklin Bridge and Philadelphia skyline. The sleek office building and cavernous plant are the result of $260 million in tax incentives offered by the state that lured the company from Marlton, about a dozen miles away. It is part of a recent wave of relocations and investments induced by the tax breaks, including Subaru of America, the 76ers, and others. The ribbon is cut for Holtec’s new tech campus in South Camden. By 2020, Holtec, which manufactures equipment for nuclear power plants, plans to employ 1,000 people at its 50-acre Camden campus, which will be fully functional in a few months, a spokesman said. 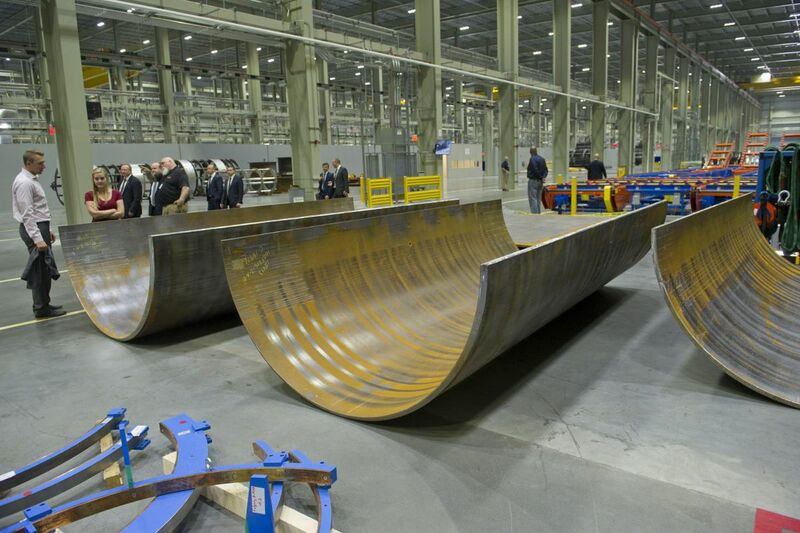 To remain eligible for the tax credits, the company must maintain at least 395 jobs at the site. The campus is named after engineer and company founder Krishna P. Singh, an immigrant from India. Singh underscored the work done by his company by noting that millions around the world lack access to electricity. "If it wasn't for these incentives, this couldn't happen," New Jersey Senate President Stephen Sweeney (D., Gloucester) told the hundreds of Holtec employees, business leaders, and officials, gathered inside the manufacturing facility. Gov. Christie noted that Camden has "a storied manufacturing history, and Holtec now becomes the newest chapter." Among those attending the ceremonies was Cooper Health System chairman, insurance executive, and Democratic power broker George E. Norcross III, who sits on Holtec's board of directors. Holtec's technology campus represents the largest private investment in the city since the passage of the New Jersey Economic Opportunity Act in 2013. Under the program, a company can earn from $500 to $5,000 in tax credits per job each year over a decade if it retains or creates a certain number of jobs. More than 20 businesses have flocked to the city as a result. Since 2010, the state has awarded more than $1.65 billion in such incentives to businesses to move to Camden. Officials hope Holtec will attract other manufacturing. The new campus will remain in the community for at least 100 years, said Holtec program director Ed Mayer. "The tax incentives helped the decision. It was not the decision maker," he said. "It is an investment." Officials say the program will bring jobs to a city that has not recovered from the post-industrial era and is marked by high crime and poverty. Nearly 40 percent of the city's 74,000 residents are below the poverty line. "The best social program is a job," said Mayor Dana L. Redd. "We are putting Camden residents to work as skilled workers." Subaru received $117 million in incentives to move its headquarters from Cherry Hill to Camden along with as many as 800 employees. Other companies given subsidies to make the move include Lockheed Martin ($107 million), American Water ($164 million) and metal recycling company EMR Eastern ($253 million). Critics of the program argue that many of the new jobs will not go to needy Camden residents, but to people in surrounding suburbs. Jon Whiten, director of the left-leaning think tank New Jersey Policy Perspective, said in a statement that the law doesn't include requirements to hire local residents. He called the scheme "misguided" and "overly generous." NJPP estimates that $7.98 billion in such tax breaks have been handed out statewide since the 2013 law passed, with Camden representing about 28 percent of those subsidies. "New Jersey erred too heavily on the side of business interests in setting the policies that govern these breaks," Whiten said. Still, companies say they are getting involved in the community, whether through direct hiring or training. Subaru spokesman Michael McHale said he was unsure how many jobs at its Camden site will be filled by city residents. But the company, he said, is funding local charities to train Camden residents to become technicians, using Subaru's facilities and equipment. "We're working with nonprofits to increase the employability for Camden residents," he said. At Holtec, 45 Camden residents have been hired to work in manufacturing jobs at the new campus, including welders, inspectors, machinists, and IT technicians. The company has also partnered with Camden County College to create a three-month welding technology program that has offered training certificates to 26 students since it began in June 2016.